August 10, 2015 – Three mules, two brothers, and a Jack Russell terrier. Together they rattle 2000 miles from Missouri to the great American Northwest in a covered wagon. That isn’t the setup for a Vaudeville joke, but there are plenty of laughs found on the ruts, roads and interstates. That’s right, interstates. The trip doesn’t take place before the Civil War, but in our time. 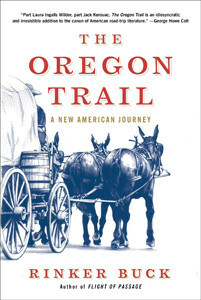 We can go along for the ride from the comfort of our reading chairs thanks to author Rinker Buck’s New York Times best-seller: The Oregon Trail: A New American Journey. It’s the first such crossing in a century, which meant our unlikely group of pioneers had to reinvent the lost art of wagon travel along the way. Mr. Buck grew up on the family farm in historic Morristown, New Jersey, and attended Bowdoin College in Maine. His career in journalism earned him the Eugene S. Pulliam Journalism Writing Award and other accolades. In his 1997 book, Flight of Passage , he shared another adventure: Piloting a Piper PA-11 across the United States in 1966. Just 15 at the time, he became the youngest airmen ever to complete the trip. You can follow his continuing adventures by liking him at Facebook.com/RinkerBuck.